People who foster animals from home don’t necessarily have huge houses and acres of land! What matters most is that they have the dedication, time, and commitment to improve the welfare of animals. There are so many abandoned, injured and unwanted animals in need of TLC, the various charities and animal shelters do not always have space-this is where foster homes can help. By offering temporary homes, where the animals receive the care they need, foster carers play an important role in the rehabilitation of pets. This work can help to reduce the number of healthy animals that are put down. Not all animals that are fostered are unwanted. Sometimes pets need knowledgeable, temporary homes because their owners are ill, abroad, or the family has fled domestic violence and is unable to care for much-loved pets for a while. Knowing that their animals are safe and well-cared for is one less worry for these people, who are usually reunited with their pets as soon as possible. There are opportunities to foster young dogs that have been selected to do specialist jobs, such as guide dogs, hearing dogs and other assistance dogs. 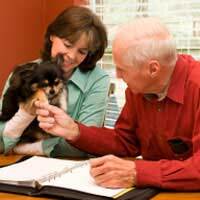 These are usually short-term placements designed to cover the various stages of dog training. Animal charities have procedures and requirements in place to ensure that those who offer fostering facilities are suitable. The welfare of animals is always their top priority, so, although qualifications are not necessary, experience is preferable. Support is available! Different foster homes offer different areas of expertise-matched to the needs of individual animals. For example, some animals may be traumatised, elderly or sick and need specialist long-term care. Others may need a stable environment in which to develop social skills and receive some basic training before they can be considered for re-homing. Animal foster carers observe and evaluate the behaviour and progress of animals they look after to make sure the pets are placed where they will fit in and lead happy lives. Some fostered pets are not suitable for homes where there are young children, while others may not mix well and need to be the only pet. How Does Animal Fostering Work? Once a foster home has been approved and prepared, the carer’s phone may get very busy! It could be that the person has a spare bedroom, which they have designated a ‘cat rescue’ room, where cats in need of emergency housing can be cared for until they are found a permanent home, or they can be safely integrated with the carer’s own pets. Some foster carers have stables, outbuildings, kennels or cattery units, built to house specific animals. It also happens that a person, who has never had a pet before, fosters a particular type of animal to see if they are able to commit to a pet full time-they sometimes adopt the cat or dog they foster! The charity or rescue centre they’re involved with has records of foster carers who can be contacted in emergencies and lists the type of animal each person is able to take in. (They can be anything from mice to horses.) This is why it’s important that foster homes are carefully checked and approved before animals can be sent to them. For someone who fosters pet cats, for example, a fresh supply of suitable bedding, food and feeding bowls, litter and trays, grooming aids and toys can be organised at short notice. Animals cost money. Many of the charities that encourage foster homes for pets help with expenses by paying for veterinary treatment, they may also provide some food and litter for trays. Other ways that can help to meet the costs of this work include getting sponsorship for individual animals-this is especially helpful in cases where an animal can never be re-homed, but can enjoy a better quality of life in a foster home than in a kennel or cattery situation. The fostering of animals from home is an extremely rewarding but time-consuming job. As with all animal-related experiences, there are happy endings and sad stories, but if you can commit to this you will have made a difference. For contact details of local charities in need of foster carers, ask at your local library or look in the telephone directory. I had my wonderful cat Diglet for 18yrs(I welcomed him into my life when he was 6 weeks, and he was even listed on my houses from fife council as a member of the household) Due to him having an accident at home inMay 2014 I had to have him put to peace. (He jumped off his chair(it took me a few weeks till I washed his blanket and put it away, he was a Norwegian forest cat)and hit the half open living room door and severed his spine, The vet said I could take him home however his quality of life would have been unfair and cruel to him. He gave me so much love and devotion to me when he was here with me. and I could not do that to my boy., he could not stand, eat or use his litter tray, I have two kids(not kids anymore their are now 25 and 21)I am not sure yet if I can totally commit to having another pet however I would like to help animals and owners in difficulty. I live on my own with a large garden and a lot of local walks in the immediate area where I live. I think there may be a time in the future where I would feel able to give an animal a home. I hope that I hear back from you as I would like to help. I Live in Cupar Fife and am very active however I dont think I could deal with a big dog.